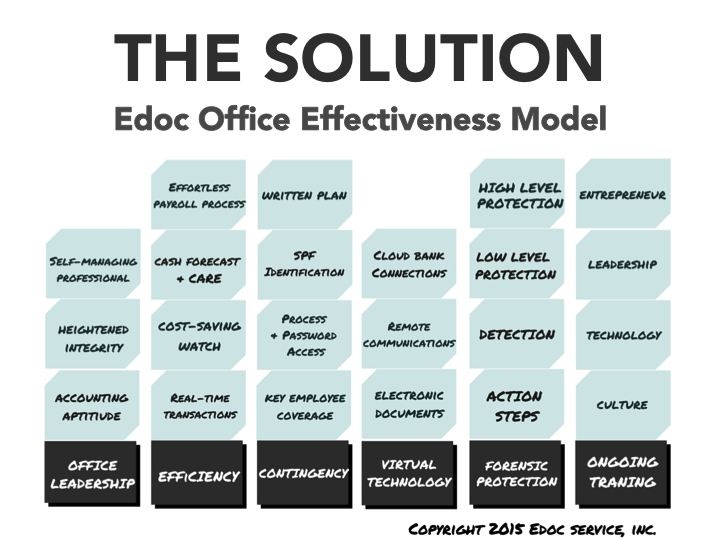 Edoc Office provides stability, efficiency and best practices to your company’s office. Poorly organized offices and staff can cause distractions and possible catastrophic loss. Don’t let this happen! Daily transactions are recorded in real time via QuickBooks for up-to-date reporting at any timend. Timely billing for maximized cash flow. Forensic watch and alert process. Your office staff may even work remotely. Saving you equipment, workspace and adding productive time to the back office. You realize it’s time for an efficient office with leadership support that can save you time and money. Your complex transactions will remain under direction of your CPA. What Else Should I Know About Edoc Office? Admin personnel remain on your payroll and in your control. We simply train, provide resources and help you select the right staff as needed. Learn more about the office support that can give you the office efficiency you’ve been looking for. administrative oversight without giving up control for office efficiency and best practices. Attention CPA’s, Bankers and other advisors – Don’t Let Your Clients Down! It is a fact that you truly care for the welfare of your clients. Edoc partners with you to provide the watch-care your clients deserve. Contact us and we will show you how easy this is.